Me and My Dog: Training Dogs: Is it Necessary? 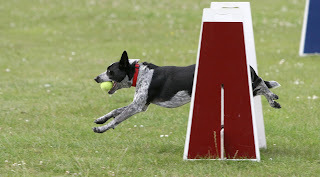 Dog owners all over the world are doing great efforts when it comes to training dogs. That it just a simple indication that well-mannered pets are more preferred than those who do not know how to behave in ways acceptable to human. But a dog that can perform various dog tricks is not the only thing that makes training important. There are other reasons to it apart from play-dead, rollover and high five. Some may not realize it but training dogs is actually one way of keeping them safe. The "stay" command can prevent your energetic pooch from crossing the street and getting hit by a car. The "drop it" command can make him drop that empty insecticide container he picked up in the trash. The "down" command on the other hand is great way to stop him from jumping up on guests while giving the command "stop it" can make him stop barking like crazy. And these are only some of the many safety benefits training can offer. Training is also a way for you to have long-time pet and your pet to have permanent home. If your pet is a well-trained one, naturally he obeys every command given. And for sure, nobody would want to give up or abandon an obedient dog. You will get to spend more time with your pet thus gives you the chance to know more about him such as his favorite toys, the training method he best responds to and other vital information concerning your beloved pet. While your dog learns something new during training, you are also more likely to get the exercise you need. Taking daily walks or playing fetch will surely keep you moving hence will help you keep physically fit. Training dogs can make you proud and happy. Who wouldn't be proud of a dog doing his business at the area you specified? or a dog that sits or stands on command? What would you feel if your beloved pet helps in retrieving illegal substances or visit patients in therapy homes? The happiness it gives is surely beyond compare. Training does not happen overnight or at the snap of your fingers. It takes time before you can finally say that your pet is a reliably trained one. But seeing him do things with flying colors will be all worth it.